Tuğrul Tanyol was born in Istanbul, Turkey in 1953. He studied Sociology at the Bosphorus University and is now an Associate Professor at the University of Marmara-Istanbul. He is considered one of the leading figures of the new poetry of the 80’s, having published seven books of poetry including Elinden Tutun Günü (Catch the Day by its Hand, 1983); Ağustos Dehlizleri (The Labyrinths of August, 1985) which won the Necatigil Prize; Oda Müziği (Chamber Music, 1992); İhanet Perisinin Soğuk Sarayı (The Cold Palace of the Faithless Nymph, 1995); Büyü Bitti (The Magic Has Gone, 2000); and Her Şey Bir Mevsim (Everything is a Season, 2006). A selection of his poems Los Laberintos de agosto y otros poemas was published in a Spanish version by Verbum (Madrid) in 2003. In the 80’s Tanyol was involved in the publication of two influential poetry reviews Üç Çiçek and Poetika and he is currently a regular contributor to Özgür Edebiyat (Free Literature) magazine. In 1995-1996 Tanyol was Vice-President of the Union of Writers of Turkey and was, in 2006-2007, a founding member of the Beyoğlu Poetry Festival. 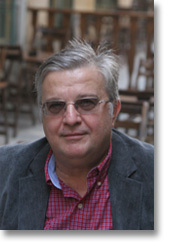 He is currently Director of the International Poetry Festival in Istanbul.